12 Comments for "Peanut Butter Cereal Bars"
What is the best way to store to keep them fresh? Would they freeze well? Store these in an airtight container or wrapped in plastic wrap for up to a week. After that time, they are still safe to eat but the quality is less. They could be frozen. Place the plastic wrapped individual bars in a freezer quality storage bag and label with the date. For best quality, use within 4 to 6 weeks. How do you store these to keep them fresh? Yummy! 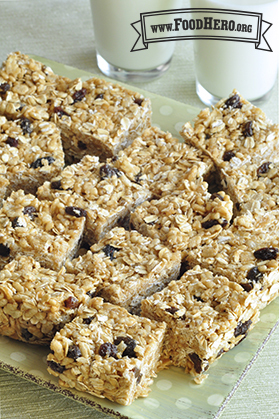 Better than store bought granola bars and soo easy! I subbed in sunflower seed butter for the peanut butter and honey for the corn syrup since I was using this for a school activity and the kids LOVED the bars! I think this will become a Sunday rock climbing day go to snack! These are delicious, and so simple! The Rice Krispies really give a great texture, and the peanut butter caramel-like sauce holding everything together is so good! I've tried to make granola bars before but they were either too crumbly or too chewy. The peanut butter mix and crunchy cereal mixed in helped eliminate both of those problems. SO GOOD!!! Super fliexible recipe. Can be eaten for snack, breakfast or dessert. And any dry fruit could be used in place of raisins. My 3 year old loved mixing all the ingredients together and its so fast to make! Yummy, although they didn't stick together as a bar very well. What about substituting honey for the sugar and corn syrup? We need to test the substitution of honey a little more to get the correct proportions. We will add this option to the recipe when we have worked out. Remember that honey is not recommended for children under 1 year old. This recipe is great, can add lots of other healthy things like flax and pumpkin seeds. We are not allowed to bring peanut products to school, do you think Sunbutter, made with ground sunflower seeds would work in this recipe? Thank you for sharing, those are great ideas! Sunflower butter is a yummy alternative to peanut butter and works well in most recipes. This recipe has been recently tested with sunflower butter and it was just as tasty! The bars turn out a little less firm than when regular peanut butter is used. Fabulous! I added some nuts to the recipe and my kids loved them! They took one to school everyday until they were gone!